The new research shows that two humpback whale populations in different ocean basins (the South Atlantic and Indian Oceans) in the Southern Hemisphere sing similar song types, but the amount of similarity differs across years. This suggests that males from these two populations come into contact at some point in the year to hear and learn songs from each other. The study titled “Culturally transmitted song exchange between humpback whales (Megaptera novaeangliae) in the southeast Atlantic and southwest Indian Ocean basins” appears in the latest edition of the Royal Society Open Science journal. The authors are: Melinda L. Rekdahl, Carissa D. King, Tim Collins, and Howard Rosenbaum of WCS (Wildlife Conservation Society); Ellen C. Garland of the University of St. Andrews; Gabriella A. Carvajal of WCS and Stony Brook University; and Yvette Razafindrakoto of COSAP and Madagascar National Parks. 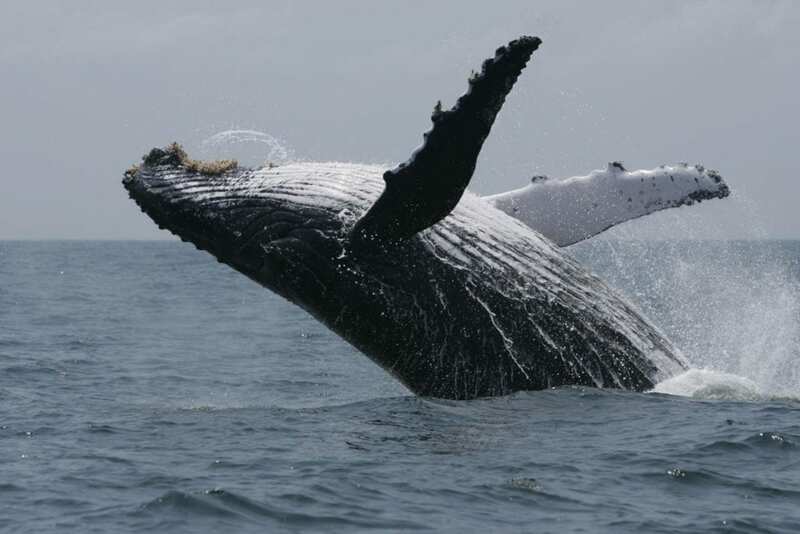 The study authors examined humpback whale song recordings from both sides of the African continent–from animals off the coasts of Gabon and Madagascar respectively–and transcribed more than 1,500 individual sounds that were recorded between 2001-2005. Song similarity was quantified using statistical methods. Male humpback whales are one of the animal kingdom’s most noteworthy singers, and individual animals sing complex compositions consisting of moans, cries, and other vocalizations called “song units.” Song units are composed into larger phrases, which are repeated to form “themes.” Different themes are produced in a sequence to form a song cycle that are then repeated for hours, or even days. For the most part, all males within the same population sing the same song type, and this population-wide song similarity is maintained despite continual evolution or change to the song leading to seasonal “hit songs.” Some song learning can occur between populations that are in close proximity and may be able to hear the other population’s song. Other differences soon emerged over time. By 2003, the song sung by whales in Gabon became more elaborate than their counterparts in Madagascar. In 2004, both population song types shared the same themes, with the whales in Gabon’s waters singing three additional themes. Interestingly, both whale groups had dropped the same two themes from the previous year’s song types. By 2005, songs being sung on both sides of Africa were largely similar, with individuals in both locations singing songs with the same themes and order. However, there were exceptions, including one whale that revived two discontinued themes from the previous year. The study’s results stands in contrast to other research in which a song in one part of an ocean basin replaces or “revolutionizes” another population’s song preference. In this instance, the gradual changes and degrees of similarity shared by humpbacks on both sides of Africa was more gradual and subtle. The humpback whale is one of the world’s best-studied marine mammal species, well known for its boisterous surface behavior and migrations stretching thousands of miles. The animal grows up to 50 feet in length and has been globally protected from commercial whaling since the 1960s. WCS has studied humpback whales since that time and–as the New York Zoological Society–played a key role in the discovery that humpback whales sing songs. The organization continues to study humpback whale populations around the world and right here in the waters of New York; research efforts on humpback and other whales in New York Bight are currently coordinated through the New York Aquarium’s New York Seascape program.